AP Intermediate 2nd Year Time Table 2019 download at manabadi, bieap.gov.in. 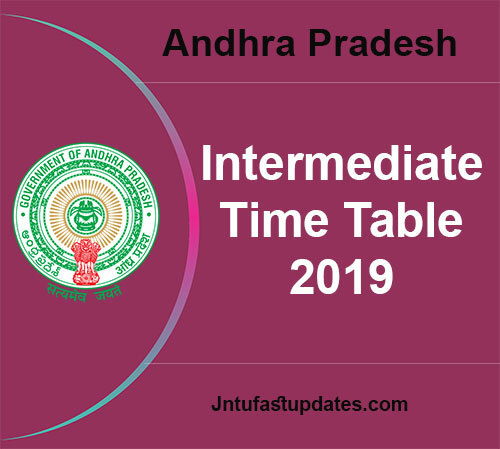 AP Inter II Year/Senior Inter Public exam time table March 2019 Released. Students can check AP Inter Second Year Exams Dates and Download PDF From Official Website. AP Inter 2nd Year Time Table 2019: Board of Intermediate Education, AP (BIEAP) has announced Inter 2nd Year Time Table 2019 at bieap.gov.in. The AP Inter Board Examinations will be going to conduct by BIEAP in the month of February/March 2019. The Candidates may download the AP Senior Intermediate Time Tables 2019 at the official website Manabadi, Schools9, bieap.gov.in. Andhra Pradesh Intermediate has taken a decision About Intermediate 1st year and 2nd year Examinations February/March 2019. They have discussed and Finally Released the Dates of AP Intermediate 2nd year Exams 2019. Check the AP Senior intermediate 2nd year exam time tables from links given below. Andhra Pradesh (AP) Government conducting the AP inter 2nd exam 2019 Separately apart from Telangana(TS) Inter 2nd year 2019 Exams. Because after the Bifurcation of Telangana and Andhra Pradesh, the two governments had decided to conducts Exams Separately with separate Question Papers. Last Year, AP and TS Governments Conducted the AP inter 1st year & 2nd year exams separately and released the results. AP Senior Intermediate/ Inter 2nd year 2019 Exams are conducting From March as per Primary Schedule by Intermediate Board. These Schedule sent to All Colleges in Andhra Pradesh and if all set, then then official AP inter 2nd year exam time table 2019 are Released at bieap.gov.in website. Already AP Inter 2nd year 2019 exam fee notification released. please pay the inter 2019 fee and get the registration number to Download AP Inter 2nd year 2019 hall ticket. Open Official Ap inter Board website bieap.gov.in or click on Above Mentioned link. Click on Ap Inter 2nd year/ Senior Inter exam Time table 2019 option. Other wise click on it save the pdf of AP inter 2nd year exam time table 2019. Stay Tuned For Ap Intermediate 2nd year 2018 Previous Question papers with answers in all in one of science, maths, chemistry, biology, commerce and others. and also stay tuned for AP inter 2nd year 2019 Hall ticket/ Admit card Download Option.